"Cyber Dragon" + "Cyber Dragon" + "Cyber Dragon" Fusion! A fusion Summon of this card can only be conducted with the above Fusion Material Monsters. During battle between this attacking card and a Defense Position monster who DEF is lower than the ATK of this card, inflict the difference as Battle Damage to your opponent's Life Points! This review is going to be painfully similar to yesterday’s, so I apologize. 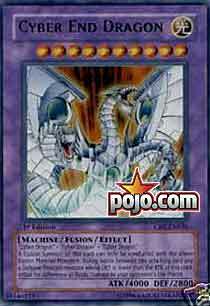 Cyber End Dragon is a hilariously powerful monster – the strongest in the TCG, actually. 4000 ATK is currently unmatched. Add that to the fact that this monster has trample – along with the other fact that Scapegoat is everywhere nowadays – and you have a highly effective monster. Throw in Limiter Removal. You have…an even more effective monster. But, alas, it’s a Level 10 Fusion that can only be Fusion Summoned by combining three cards (Cyber Dragon x3). Being Level 10 makes it unnecessarily hard to bring this out through Metamorphosis, leaving two real options: Power Bond and Cyber Stein. Cyber Stein costs 5000 Life Points, meaning you’d better get this out early on in the duel if you plan on winning that way. Power Bond has that nasty little drawback of still needing the Fusion Material monsters, which really means your only option (without my getting into a review of Power Bond) is Cyber Stein. Of course…it’s a Fusion. So run 3. Yesterday's card had 3 uses. This has only one, but if you're using it right, you've just won. Jerome McHale put out a great write-up on Metagame as to how the deck works -- basically, you clear the opponent's M/Ts with Giant Trunade or Heavy Storm and hope the opponent chains Scapegoat; you summon a Cyber-Stein, pull out Cyber End Dragon, and either Limiter Removal it or Megamorph it (since it's a machine, either will work!) to have an 8,000 trampler ready to tear up a sheep token. The deck uses the same drawing engine as the standard Mill deck, with Cyber Jar, Book of Taiyou, Book of Moon, etc...in this case, Book of Taiyou also doubles as offense with opponent face-down monsters. I'd rather have to dig for a second Limiter Removal or a Megamorph and a Limiter to take out an opposing BLS than go through a face-down and worry about whether or not I've clinched the game that turn. The other beautiful thing is that the deck sides out to a full first turn mill deck, so if your opponent happens to let you go first in Game 2, thinking that this way they'll be able to adequately prepare for an opposing onslaught of the Cyber End Dragon...by the time their turn rolls around they won't have any cards left in their deck. Seriously, get this guy. Get 3 of him if you can. As he's a Fusion, there's NO bad side to playing him. Coin Flip Hmm. Unlike yesterday's card, today's OTK isn't built in. A 4000 ATK Machine is a very dangerous thought. 10 stars makes him very difficult to Morph, but still not impossible (damn you and your combos, Koitsu). Cyber Stein is actually a good way to use this. Giant Trunade, they play Goats... Ooh, my stomach just churned at the though. Summon Cyber Stein, summon Cyber End, attach Megamorph or play Limiter, hit for 8000 to a Goat or something... It's even worse if you pop out two Limiters. 16000. o.o I only achieved that once when I toyed with a player after getting 9 card advantage on him. Unfortunately, the deck in question is nothing but situational, and the best it can hope to accomplish is knocking out the occasional unprepared player. The First Turn Kill Mill is better than this, and the FTK Mill is pretty inconsistent. However, that doesn't detract from this guy's playability by much. RONIN tells us that is the ONLY 10 star Fusion monster in the game. While some people will cite UFOroid Fighter, I will cite 0/0 and tell them to go away, especially since a Level of 10 doesn't matter if you're not Morphing it out. So, as a more accurate note, this is the only IMPORTANT 10 star Fusion in the game. Should you get it? Actually, you already know the answer to that question, but I'll tell you to get one for your Fusion deck anyway. Oh, it should be noted that this monster is actually likely to be summoned. There is a deck based all around Creature Swapping your opponent a Koitsu and then attacking it with KA-2 Des Scissors for a quick 5000 damage. Assuming that you play this deck, you can Sakuretsu Armor the Koitsu and zomg 2 - 0 ggnore. You are more likely to see that view in person than you are to successfully Fusion Summon this card ever. With Power Bond... Wow, that has just blown me away. However, 5/5 for sheer you can include it in your Fusion deck with no consequence playability. Let’s mix things up and start with CEndD’s effect: It has a piercing ability. With that said, CEndD is a 4000 ATK Machine. I think it’s fair to say "dude" in this situation. A 4000 ATK ANYTHING warrants drooling, and a built in defender thwarter only opens the floodgates for said drool. Then there’s the whole Machine bonus. With Limiter Removal you can make CEndD an 8000, 16000, or 32000 ATK trampler depending on how many Removals you want to use. Insert "dude" here. So, now that we’re aware of CEndD’s awesome potential, how do we reach it? Well there are a few methods you can use: You can TRY to use Metamorphosis, though I doubt you’ll have an easy time getting a Level 10 monster onto the field. You can try The Light - Hex-Sealed Fusion, but that would require having too many monsters on the field. There’s always actual Fusions utilizing Polymerization or Power Bond, Power Bond reaping the most benefits by making CEndD a default 8000 ATK monster, but both of those options require too many cards. So that leaves us with Cyber-Stein. Not only is it the easiest way to summon CEndD, but also it makes Megamorph that much easier to use. Why Megamorph? Overall, CEndD is the newest addition to OTK family. Whether or not it will see great amounts of play is not for me to say. But if you’ve got the right materials, you might as well go for an easy win. Advanced: 4.5/5. You should at least put it in your Fusion Deck to show off. Traditional: 4.5/5. The availability of Raigeki and Harpie’s Feather Duster only make sit more appealing. Art: 3.5/5. I’d think a monster with such devastating potential would look more… devastating. dawnyoshi Wow. A morphable level 10 fusion monster…with trample! It can also be summon via Cyber Stein. Yeah, this card is officially stupid. Anything that involves a first turn kill is stupid. If you’re not running first turn kill, then sell this stupid card. It’s bound to fetch you about half the price of a booster box. Dark Paladin As our week of CRV cards comes to a close, here we come to the only true reason to play Cyber Dragon or a themed deck of that nature. 4000 attack with trample makes AGG from TLM look like dogshit. 9000 attack with trample makes everything look like horseshit. On a final note, be one of the "few" *chuckles* who comes up with the OTK/FTK with this card. First one to send me an e-mail of it wins a 50 cent piece. Seriously though, this card IS good, despite the horrible hand management involved with Fusion. Read my article about this card, if you haven't done so.